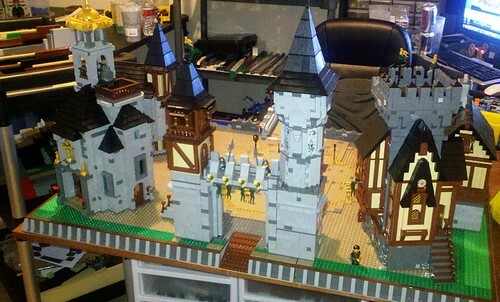 Sorry I've been away...but it is now time to begin planning the Castle layout at BrickCon 2012. I have not preconceived ideas this year, so lets discuss it and see what wild and crazy things we come up with! I'm working on another castle/fantasy landscape display. It'll be big, bigger than last year's, but it's not going down to the floor this time. (Instead, it'll go UP!) It'll fit fine in a collaborative display, but if we have the same space as before, it'll likely span the whole depth of the tables, so any collaborative sets can connect on the sides. I'm planning out how to do the build, but probably won't have details until I'm nearly done. If we're doing a collaborative display, I'll build/bring parts for filler, and try to have roads, cliffs, rivers, etc. that can join up and hide borders. Personally, I think a collaborative display would be more interesting if it has some kind of theme or story running through it, even if it's just a common element repeated in different areas. It doesn't have to dictate exactly what people build, but it can help define the display as a whole. My thoughts on a theme is either some distinctive creature milling around each area causing trouble, or maybe a decorative building motif or image, zombie invasion, or some other thing that is simple enough for anyone to incorporate. I dunno, it's an idea. I will be there..unfortunately I have to leave on Sunday early...so I can't bring anything, but I can help build while I'm there. Theme or no theme, I like how you have planned it over the last few years Josh..with water, desert and land areas...providing for all of the different areas of castle. We should do a historical layout. No fantasy allowed and strict research required. Speculation suggests I will be there again this year. I'd like to continue expanding on my layout (and maybe bring everything this year). With that in mind, I think I can fill a 90"x60" area (90" linear table space, full depth). I probably won't fit into the big group effort, but as always, my display will be Base-8 compatible and I would love it if any other Base-8 folks adjoined my display. My next big castle will probably be a Kingdom's castle. I seem to recall somewhere (cannot find the thread right now) that the LCC project was proposed as the structure for BC this year. Is LCC going to be a sub-section, the whole thing or totally separate? I would LOVE to do an LCC section for the castle layout. So far I think the other idea that's on the table is the Age of Empires layout. Jubal has a barracks already built, David Frank is doing a town center, and I'm going to do a Teuton castle. There is another thread for that layout in this section of the forum, so check it out. As for an LCC section, how many LCC members are planning on attending BrickCon? I'm guessing Aliencat is, but not sure if he has room/time to bring an LCC MOC. Anyone else? Just an FYI: Brickcon's overarching them is "Happy Anniversary!" as this is our 10th year and Seattle's beloved Space Needle hits 50. -If you want to do LCC, that's great and fine, but I'm hesitant to make it ALL that. Because remember, people contribute to the castle display that aren't active CC members, if they're registered at all. -Also, make it Base-8, as we have in previous years, to make it easier to make modules to fill in spaces and stuff like that. I have already sent Josh my layout. Basically it will be 4 -32x32 baseplates wide by 6 - 32x32 deep. The front will be a medieval village with each building about 8x8 inches and 12-15 inches tall. The rear section will be forest transitioning into a mountain and bridge with a large Castle Facade reaching roughly 3 feet tall. That is why I let Josh know as early as possible so they could plan accordingly. I will keep the AoE display on the small side as we dicussed. I already feel bad about how much space i am using, but I am excited to show this in October! AK_Brickster wrote: ...the other idea that's on the table is the Age of Empires layout. Whoops sorry, that was what I was thinking about. I have not really been following these projects. Fraslund wrote: I have already sent Josh my layout. Basically it will be 4 -32x32 baseplates wide by 6 - 32x32 deep. The front will be a medieval village with each building about 8x8 inches and 12-15 inches tall. The rear section will be forest transitioning into a mountain and bridge with a large Castle Facade reaching roughly 3 feet tall. Crap, you're further along than me... and I have more to do! I'll have a more detailed layout eventually, but it's looking like a 60"x80" footprint right now. Is anyone working on Base-8 modular stuff anymore, or are folks just making the edges of their big displays Base-8 compatible? I like working in Base-8 modular because then I can continue adding to my display, and re-configure it as necessary given space constraints and new stuff I want to display.